"Be so good that they can't ignore you." Well, here's our big travel tournament for the season. I know everyone has been looking forward to this weekend, and I'd just like to pass along a few reminders. Get your skates sharpened. 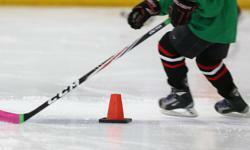 You never know exactly what kind of ice you will encounter at these tournaments, so make sure your skates are sharp. Have a spare stick with you, as well as extra tape. Both jerseys must be brought with you. We are both home and away in the preliminary round, so both sets will be worn. Parents, make sure all travel documents are accounted for in order to cross the border. Oh, and bring swimming stuff, as there is an indoor pool at the hotel.